Moderation option opens up a possibility to conduct private conversations within a Podcast. In a Moderated podcast all Synths from Participants start private by default. The Moderator can respond privately to each of those participants. Only individual Synths from the Moderator will start visible to all Participants of the Podcast. As a Moderator, you can leave Synths private, or make it viewable-by-all-participants on a case-by-case basis using unlock icon on the Playback. NOTE: Once enabled, Moderation mode is a life-time setting for the Podcast and cannot be switched off. 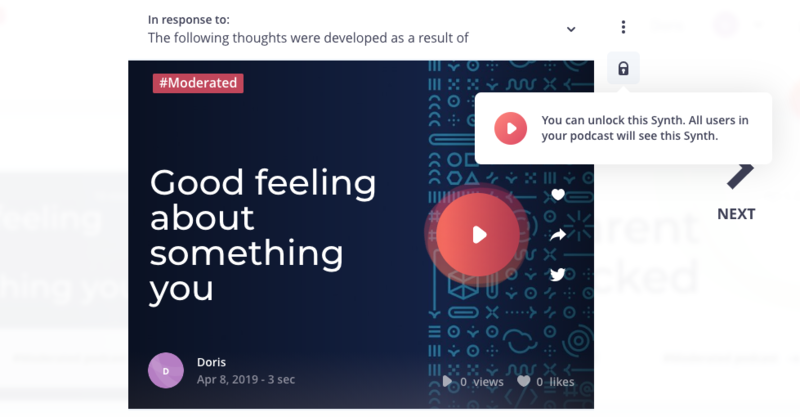 Any Podcast can be converted to "Moderated" unless it has multi-level threading already entered by participants.